As the Outdoor Retailer Summer Market trade show kicks off its first summer in Denver, Colo., the political and activist nature of the gathering and its organizer, the Outdoor Industry Association (OIA), is coming more clearly into view. OIA relocated its trade shows for 2018, including its annual Snow Show and the Outdoor Retailer show, to Denver from Salt Lake City following last year’s dustup over public lands issues. 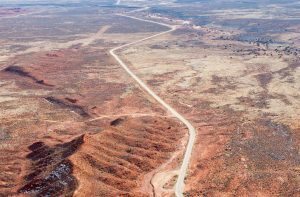 The trade association feuded with Utah elected officials who supported the U.S. Department of the Interior’s planned reduction of Bears Ears National Monument and called for more access to public lands for natural resource development. “I guess we’re going to have to part ways,” Herbert said. The public lands debate spilled over into the halls of Congress throughout 2017, as Patagonia founder Yvon Chouinard and the House Natural Resources Committee publicly sparred over the national monument reduction in statements and on social media. Chouinard ultimately rejected an offer from Chairman Rep. Rob Bishop (R-Utah) to testify on the public lands debate. A Western Wire review of OIA documents, social media, and planned agenda for its Summer Retailer convention revealed a political activist aim beyond claims of simply defending public lands. “Look at us, indeed. Just more than a year after that spark was ignited, the outdoor industry has galvanized as a political and economic fireball rolling forward with a new sense of unity and strength, spurred by a combination of unified values, economic muscle (2 percent of the national GDP, $887 billion in consumer spending and 7.6 million direct American jobs) and unprecedented member engagement,” Willoughby continued. “What the anti-public lands contingent failed to calculate is the outdoor industry’s newfound clout. They may have just poked the bear,” Willoughby concludes. Outdoor Retailer’s first Denver event, the Snow Show, opened in January. “The beer is stronger, the peaks are taller and the recreation is higher,” said Conservation Colorado’s Maria Handley to contrast Denver to Salt Lake City as the venue for the trade show opener. “If there’s any doubt that we made the right move coming to Colorado, I think it’s dispelled,” said John Sterling, Director of the Conservation Alliance. To bolster their claims that the move was not as partisan as it first appeared, Colorado Gov. John Hickenlooper was invited to speak on Colorado and public lands issues. But that week members of the outdoor industry and environmental groups presented their strategies for political campaign messaging in the 2018 mid-term elections at an industry lunch hosted by OIA with presentations from activist groups like Center For Western Priorities (CWP) and the Hispanic Access Foundation (HAF). Their mission: how to figure out messaging for a target audience that did not list outdoor industry objectives as a top-tier get-out-the-vote issue. “Only 2 percent named anything relating to the environment in terms of having any bearing at all on their presidential vote. That included climate change, that included public lands, that included anything related to the environment. So if it’s only 2 percent, you’re never going to change those policies,” pollster Lori Weigel told the attendees. Jennifer Rokala, Executive Director for CWP, told the attendees her group planned a public lands-based campaign in the midterm, building on messaging from the last two election cycles. 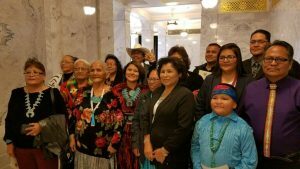 As Western Wire noted in January, the luncheon presentation did not include voices from local groups within the West opposed to expanding public lands, such as those local residents, tribal members, and other elected officials who welcomed President Trump’s announcement to reduce Bears Ears and Grand Staircase-Escalante National Monuments in December 2018. Patagonia and environmental organizations like the Wilderness Society upped the ante ahead of the January meeting, projecting clocks onto the Bureau of Land Management’s Colorado office and Denver’s Civic Center that showed the countdown until Bears Ears and Grand Staircase-Escalante National Monuments’ new boundaries went into effect. OIA’s Roberts argued that many companies used their brands in promoting their side of the debate—organizing and calling for action, like the activism and social media pushes mentioned earlier, but also, more importantly, in voting. “I think we have to continue to raise awareness so that when people go to the polls it becomes a voting decision. We’re still playing a lot of defense at the national level, but I think we’re seeing more opportunities to make an impact at the state and local level, especially in rural areas with opportunities to build an economy around outdoor recreation,” Roberts said, pointing to public awareness and alignment through OIA companies and their political outreach efforts. Those efforts include OIA’s call-to-action for the “We Are Still In” movement that opposed the United States’ withdrawal from the Paris Climate Agreement, calls for 100 percent renewables by customers and member companies, and “scrutinizing the supply chain” of member companies. “It’s great to be putting in solar arrays at your headquarters and sponsoring wind, but as a manufacturing company, you have a big supply chain, and that’s hands down your biggest impact,” said Ali Kenney, Burton’s Vice President of Global Strategy and Insights. The upshot: companies and consumers need to “advocate”—and there is strength in numbers. “Nowadays, the issues are so big that collaboration is absolutely mission critical. We aren’t going to move the needle unless we get other brands on board to help,” said Corey Simpson, a communications coordinator for Patagonia. “The health of the outdoor industry is inexorably tied to the health of our planet. We know that we must advocate for effective climate policy while also reducing the impact of our business on the environment. But for many outdoor businesses, knowing where to start, what to do, and how to make an immediate difference can be baffling. Learn how to approach the challenges of global warming using scalable strategies that work – whether you’re an executive, sustainability or marketing professional, brand athlete or ambassador, or social influencer,” OIA wrote. In May, OIA touted its “#ClimbTheHill” lobbying effort. “Our own @JessOIArec is at #ClimbTheHill with climbers and OIA members @accessfund + @americanalpine to lobby lawmakers on key outdoors issues—like LWCF. We love to see so many professional athletes and climbing advocates in DC to make their voices heard!” OIA tweeted. The event was described as “lobby training” by a separate Twitter account. “As we build out the OIA climate toolkit, we are exploring new and existing projects and programs around renewable energy procurement and carbon reduction to help support outdoor industry companies with their climate strategies and goals,” OIA wrote. “If you are planning to attend this meeting, please watch the following webinar recording, Tackling Carbon Reduction in the Outdoor Industry – Clean by Design, NRDC,” the agenda states (emphasis in original). The webinar is designed by Natural Resources Defense Council, a group that received more than $14 million in grants from deep-pocketed philanthropies between 2011 and 2015, according to a recent study by Matthew Nisbet. 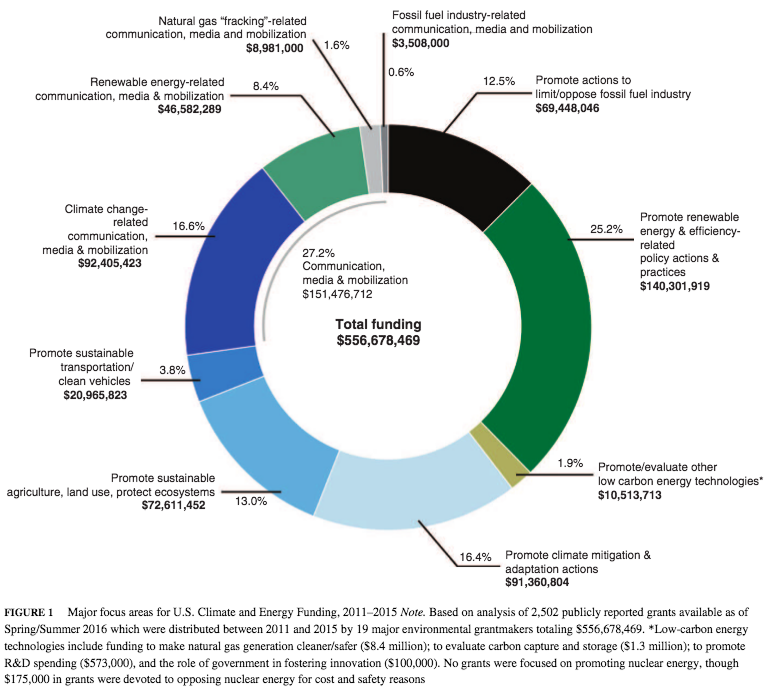 Nisbet, Professor of Communication Studies and Affiliate Professor of Public Policy and Urban Affairs at Northeastern University, analyzed more than half a billion dollars in “behind-the-scenes” grants distributed by 19 major environmental foundations to groups promoting renewable energy and opposing fossil fuels. This week at Summer Retailer, several events will continue the focus on public lands and activism. On Monday the convention will feature a panel, “Finding Common Ground on Public Lands.” After finding little common ground on the public lands issue in its former host state—the move to Denver from Salt Lake City was entirely predicated upon a disagreement over a specific public lands issue—it is not clear whether the panel’s stated intent represents an attempt to return to dialogue or a chance to solidify its own activist posturing. Tuesday opens with a breakfast keynote on public lands sponsored by the Conservation Alliance entitled, “Defending Our Common Ground: American Public Land From Teddy Roosevelt To Donald Trump.” Author Timothy Egan, also an environmental and liberal political columnist with the New York Times, is the speaker. “This summer’s event will focus on the theme “Our Stories, Our Lands,” highlighting the ongoing importance of protecting and preserving public lands,” the agenda states. Pushing brand advocacy will wrap up the week.